In the past it was often the far right that opposed freedom of expression. There was once a movement in one state to ban the book, The Wizard of Oz because it has as one of the characters “a good witch.” I have personally experienced the dogmatic closed-mindedness of extreme Christian Fundamentalists, and I believe I can recognize that mindset in other groups, both right and left. Pat Buchanan was recently fired as a commentator on MSNBC. I have found his books to be well-argued, and Mr. Buchanan has a vast knowledge of history that is sadly lacking in most Americans. I agree with his view that immigration should be limited so that those who move into the United States have sufficient time to assimilate to the culture, especially if they come from nations without a tradition of democracy. His position against free trade and in favor of tariffs on incoming Chinese goods is also a good suggestion, a first step in bringing back some of the American manufacturing lost through outsourcing. The same follows for his suggestion that the United States revoke NAFTA. As a traditional Anglican Catholic, I agree with most of Mr. Buchanan’s views on theology and ethics. I also believe that the 1947 partition of Palestine has been a disaster, and although Israel has a right to exist and advocate for her national interests, the United States should not provide support for Israel no matter what she does. Too many people confuse antisemitism and anti-Zionism–they are not the same thing. Many Jewish people are anti-Zionist. Mr. Buchanan’s book, The Suicide of the West, is what got him into trouble with MSNBC. Under pressure from radical leftist groups who claimed the book was racist and “homophobic,” MSNBC’s (already radicalized) staff decided to fire Mr. Buchanan. I have read The Suicide of the West and find it to be a convincing indictment of the Enlightenment attempt to deny that humans are embodied by denying that embodied properties, even accidental properties, have a great deal to do with an individual’s perceived self-identity. While Americans of European descent do not usually have a specific sense of identity, both African-Americans and Hispanics tend to have a strong sense of identity. Pat Buchanan never says that there is anything wrong with that–he states that it is a part of human nature. Unless there is a consensus civilization to unify various ethnic, religious, and cultural groups, a multicultural society cannot work in practice and leads inevitably to violence (as is the case in California, especially in the prisons, today). For many people in the world, their self-professed identity includes race. 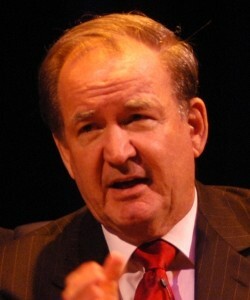 Mr. Buchanan does not condemn them, but suggests that such self-identity resists being placed in a “melting pot.” Ethnic and tribal strife in the former Yugoslavia, the former Soviet Union, in Somalia, Uganda and other African nations that were artificially divided across tribal lines by European colonialists, are examples, as are some Asian countries. The United States may believe it is beyond such strife, but in the end, the human propensity to divide into self-contained groups will win out over multiculturalism (or “multi-civilizationalism” as one commentator in Chronicles Magazine once noted). Mr. Buchanan has also affirmed traditional Roman Catholic moral positions on sexual ethics. This has resulted in a hostile reaction from groups that hate Roman Catholic restrictions on sexual behavior. But as Mr. Buchanan says, “Since when did it become a crime to express traditional Catholic moral positions?” Apparently it is a crime today. A libertarian might argue that as a private company, MSNBC has every right to fire or hire employees. From a legal point of view it does. But from a moral point of view, it is interesting that a network that claims to value pluralism caved into to radical pressure groups that do not accept freedom of expression. There is hypocrisy there. Left wing political correctness is out of control, just as Fundamentalist political correctness was rampant among some people around whom I was reared. Someone will probably attack my view, stating that the “progressive” position on issues is the only correct stance to take. Such a claim requires argumentation to justify, not bullying.